Imagine a conversation between two people who will never meet. That is what happens when we encounter a work of art in any medium, something is transmitted between the artist and the viewer or audience. It is a conversation, for just as the artist conveys thoughts and feelings through the work, we read into it with all our feelings, knowledge, and experiences. Sometimes it’s a casual conversation soon to be forgotten, sometimes the connection is so strong it may change the way we see and experience the world. To engage deeply with a work of art is to invite change and disruption into our lives. Entropy, a new dance work by Noa Shadur, has me reflecting on these kinds of conversations, and their reverberations. Performed by five female dancers clad in black and white, in a minimalist environment of space, sound and light at the Tel Aviv Museum of Art, Entropy, with its abstract aesthetic, smoldering sensuality, intricate and precise formal language and intense physicality is a striking, alluring and thought-provoking work. It’s the kind of dance piece that holds the viewer in thrall, mesmerized by the forces and emotions it arouses. Yet in this conversation there are other voices, and this multiplicity renders the work all the more intriguing. 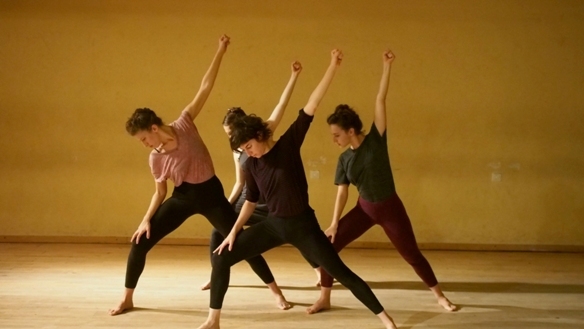 Shadur was invited to participate in the Following Footprints project, creating a new dance inspired by the work of an esteemed Israeli choreographer. She chose to explore the work of Noa Eshkol, co-creator of the Eshkol-Wachman Movement Notation. 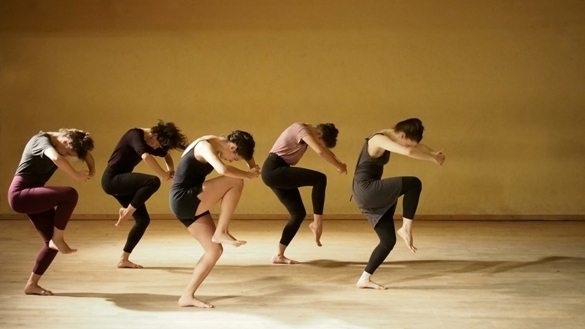 Although she had not been previously acquainted with the choreographer’s work, Shadur studied the choreography and methods of Noa Eshkol from the notation and more significantly from Eshkol’s dancers, the carriers of the flame. She was inducted into this very particular way of thinking and moving, and in creating Entropy, let her own way of approaching choreography be open to the influence of Eshkol’s work, with a focus on “Suite” created by Eshkol in 1966. The resulting piece is not a revival or imitation of Eshkol’s work at all, but rather a work that exists entirely in its own right, permeated by a multiplicity of voices. The performance at the Tel Aviv Museum of Art is a truly unique experience. Racheli Nul-Kahana and Ruti Sela, dancers in the Noa Eshkol Chamber Dance Group who trained and worked with Eshkol, open the evening with three short sequences from Eshkol’s work. These dancers embody the choreography so entirely, they are dance, and watching them move is a revelation. There was a flow to the brief sequences of dance, a harmonious unison of the two dancers moving almost as parts of a single organism, punctuated by poetic asymmetry. Eshkol’s dances were performed without set or music, the dancers clad in simple black leotards, to allow the focus to remain entirely on the movement. This brief and powerful introduction was followed by Shadur’s Entropy. Shadur is very attuned to the visual and sound environment, and the ways in which they influence thought and feeling. Previous works, such as We Do Not Torture People, and Calypso, are replete with cultural references as expressed in movement, set, costumes, lighting and soundtrack. In Entropy, Shadur and her talented team have created a minimalist environment effective in establishing a contemporary and somewhat ominous sensibility, yet still in correspondence with Eshkol. As the work opens, the five dancers stand in formation at one end of the floor-level stage space, remaining poised and still. Time elapses, and there is a sense of suspense that is not uncomfortable, signalling perhaps a different sense of time. The dance is abstract, with a clear formal language. In some ways, it might be seen as a continuation of Eshkol’s work, yet it soon develops into its own strange creature. A signature element in Shadur’s work for me has always been the way in which relationships of power, dependence and inter-dependence are symbolically expressed through movement and gesture. This was profoundly felt in Entropy, a work with an explicit formal structure. A structure that gives form and meaning, the break and rupture of that form that creates new meaning, and recurrence of form in new configurations. A strong dynamic developed between the dancers, delineating different divisions of the group and the individual, the push and pull of forces in a field. Even in their unison, the dancers clearly exist as separate entities that might – and do – break away or break apart at any moment. In considering the reverberations between the two choreographers, I would invoke the term intertextuality, because there is more at work here than influence alone, although certainly influence, intentional influence exists. Intertextuality refers to the way one text shapes and affects the meaning of another, and it is in our reading/reception of these works that intertextuality takes place. The trace of Eshkol in Shadur’s Entropy is in plain view, there is even a small sequence that is a direct quotation, performed, as in Eshkol’s version, without an accompanying soundtrack. Yet these traces of resemblance also place an emphasis on the difference, and experiencing Shadur’s Entropy informs our experience of Noa Eshkol. The fingers articulating the flower Narcissus in Eshkol’s work reappeared before my eyes in Shadur’s Entropy, imbued with distress, a certain unspoken frenzy. A brief fleeting moment and vision, yet it sends me back, sends me wondering. Shadur’s dancers emanate a power from within, every movement is replete with intention. There is a sensuality in the way they touch their own body, a hand caresses a shoulder, moves down the arm – then the moment is gone without a trace. There is a rising tension in the forces felt between the dancers, as they look and do not look at one another. The moment of contact arrives, yet there is nothing predictable in this world Shadur has created. The dancers connect and unravel, the encounters ambiguous, ominous yet somehow tender. A dancer reaches her arms on both sides of another dancer’s head, measuring as if with calipers, a gesture cold and calculating, that is also a reminder: yes, this is the human scale. It is an angular world of straight lines and sometimes sharp movements, it is a world with sudden, unexpected curves and undulations. Entropy is a stark world that resonates with beauty and questions: how we take from one another, how we give. Entropy will be performed at the Tel Aviv Museum of Art on February 28, 2015 at 20:00. Places are not marked, so it is recommended to arrive early. To order tickets, call: 03-6077020. Choreography by Noa Shadur; Dancers/co-creators: Einat Betsalel, Yuval Gargir, Aviv Horovitz, Ofir Yanai, Ayelet Nadav; Guest dancers: Racheli Nul-Kahana, Ruti Sela – Chamber Dance Group; Music: Mohammad, Powell; Soundtrack: Shahar Amarillio; Rehearsal manager: Iris Marko; Set design: Dan Hasson; Producer and assistant choreographer: Roy Bedarshi; Costumes: Joanna Jones; Lighting design: Dani Fishof – Magenta; Following Footprints Artistic Director: Naomi Perlov.